Back to the house refurbishment story where I endeavor to show you the before, during and after of various rooms in the pigeon house. This week it’s the entrance hall at garden level. You may remember there was no staircase between the main entrance and this level. 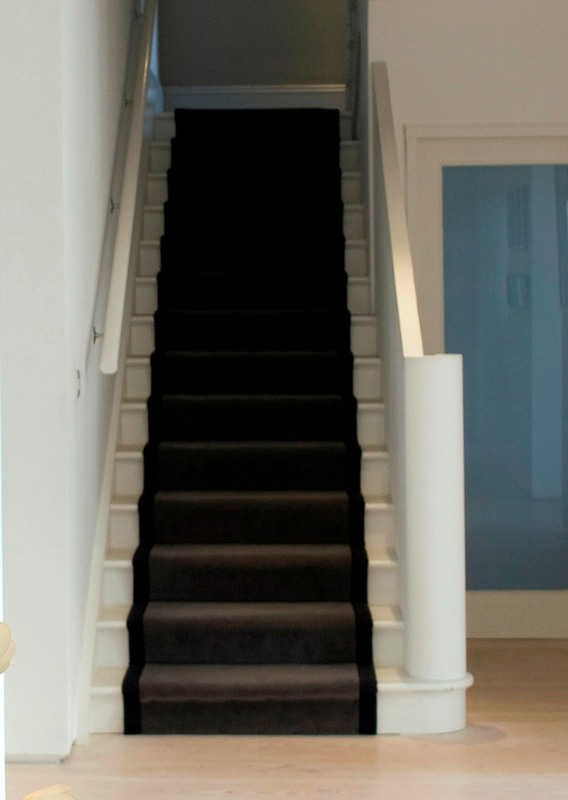 Our plan was to create a new stairs where the original one would have been. As the garden level had no original historic material whatsoever, the approach here to the refurbishment of the period property was completely different to other parts where it was both necessary and desirable to be true to the original. Here we took a decision to adopt a contemporary approach. This photo shows the hallway somewhat cleared out. 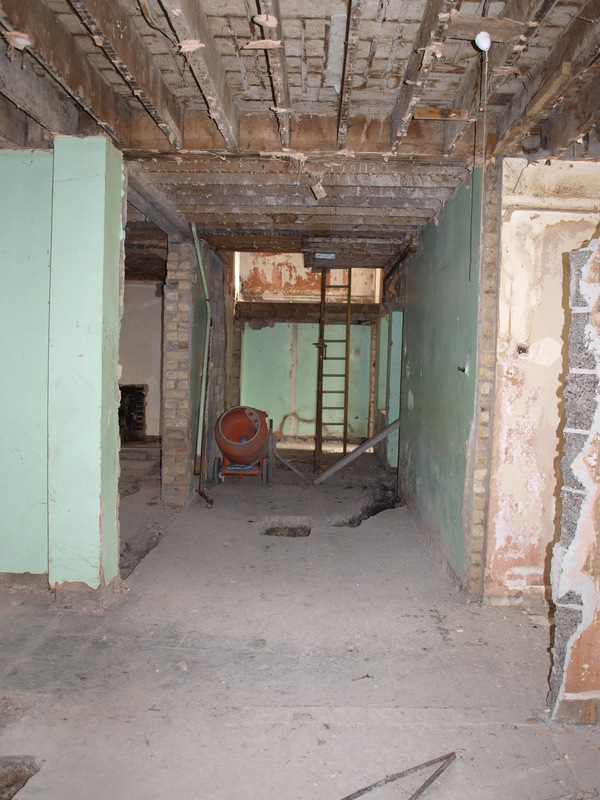 The doorway to the kitchen will be formed to the right of this picture. The ladder is in the position where the new stairs will connect with the upper level. The concrete floor slab was reinstated and underfloor heating laid on an insulated base. Looking from the other direction the hall looked like this. This view shows a side window in the house. 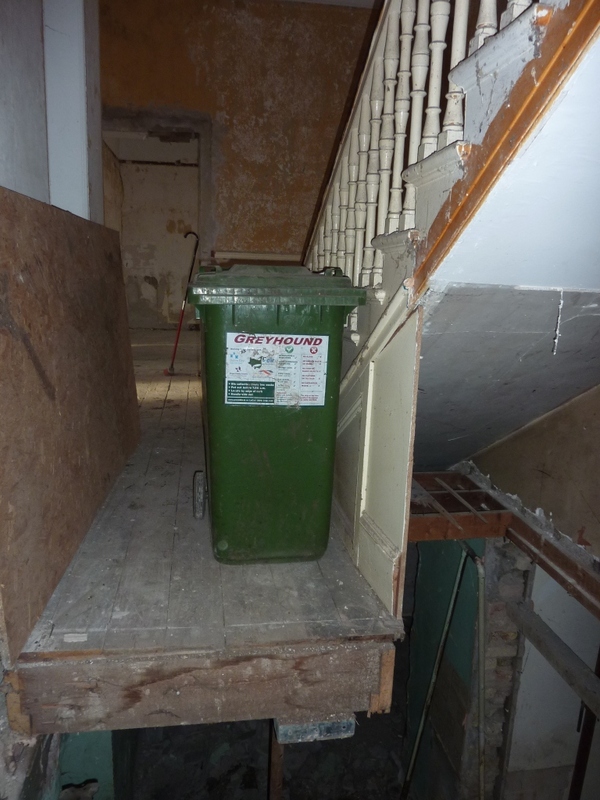 It is exactly as when purchased except that a lot of loose debris has been removed for clarity. 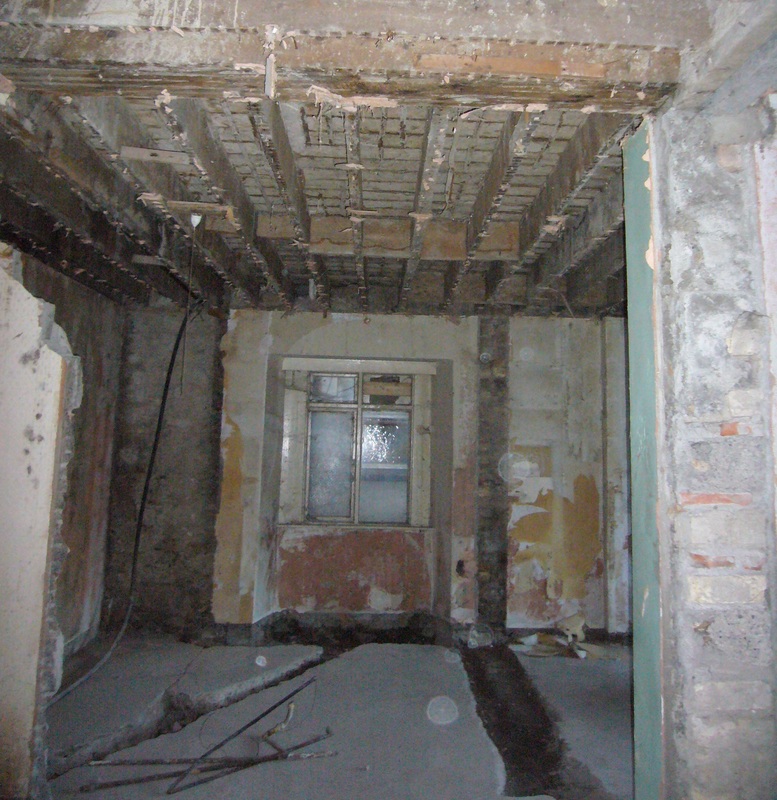 As you can see the floor had been partially dug up, the ceilings had been removed as had some internal walls. Who knows what the plan may have been! 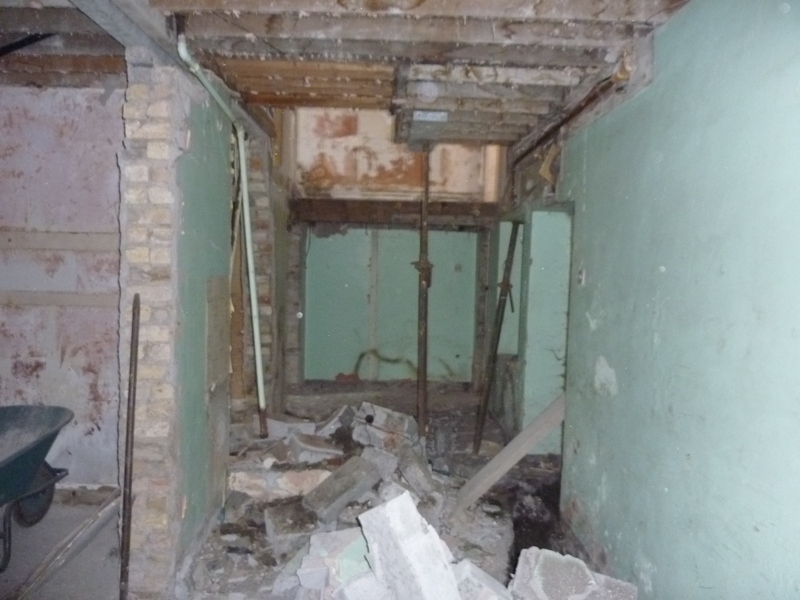 Our plan was to knock down the wall under the window to turn it into a doorway, keeping the splayed opening and reinstating the wall to the right of the window. To the left of the window we proposed building in cupboards for storage of coats, sports gear, shoes etc. 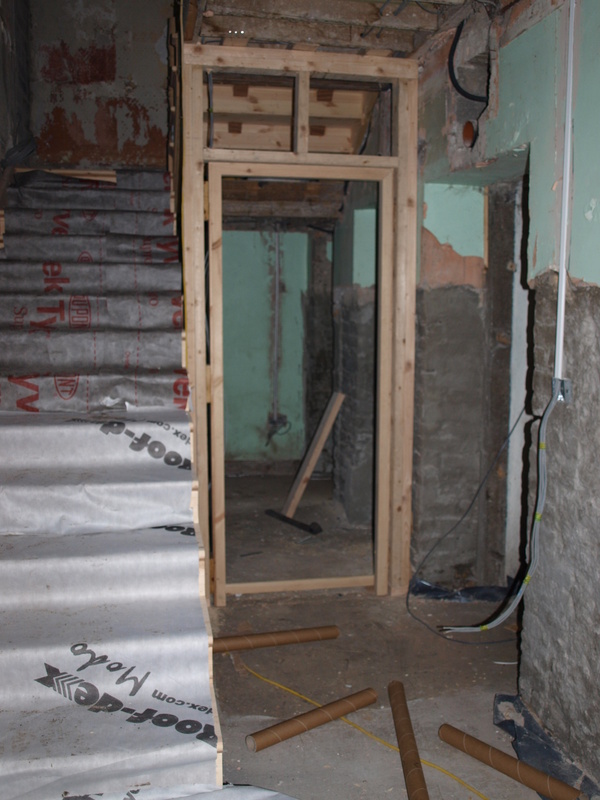 This photo shows the new staircase going in and the frame work for a door into a laundry room under the stairs. 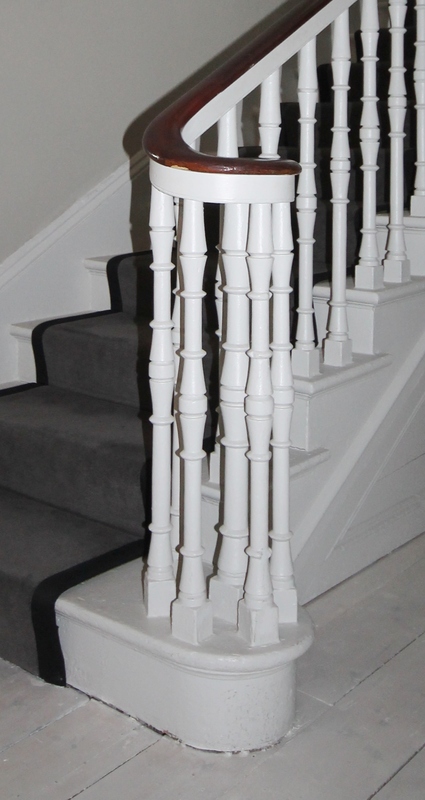 The new staircase was designed to be contemporary, with a solid balustrade but with the newel post taking inspiration from the original staircase upstairs. 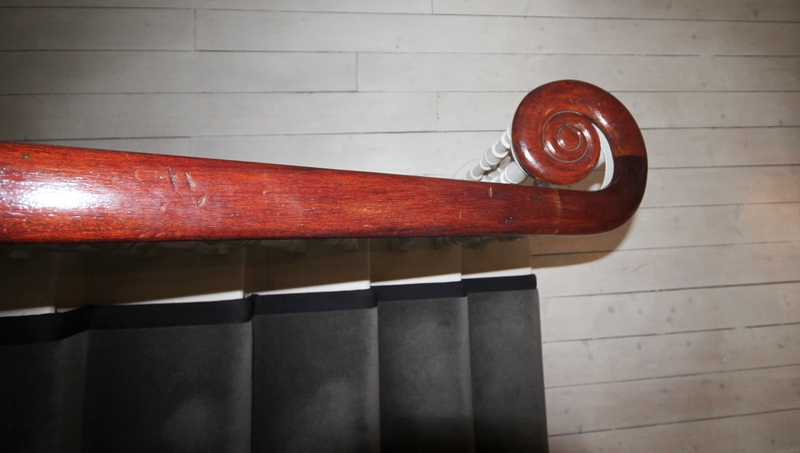 Photos of original staircase upstairs. 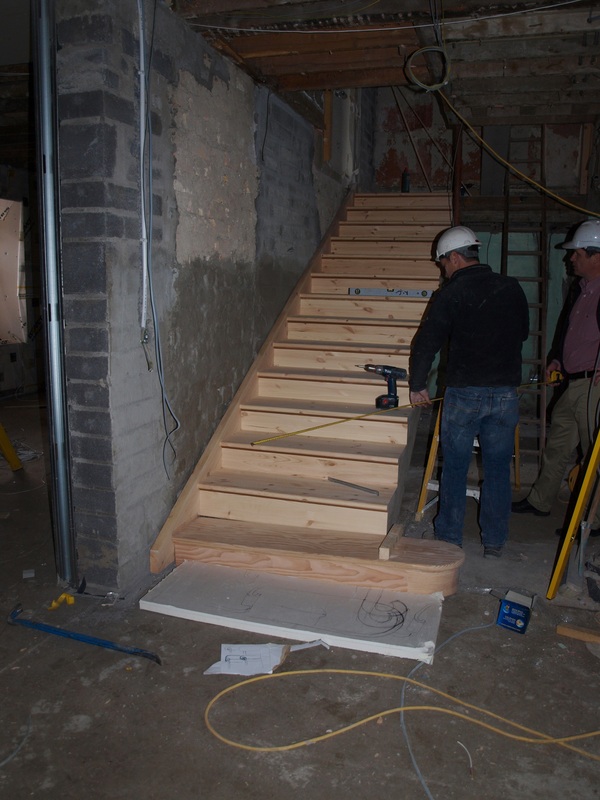 Views of new staircase under construction. This is the finished product. View from new side door. 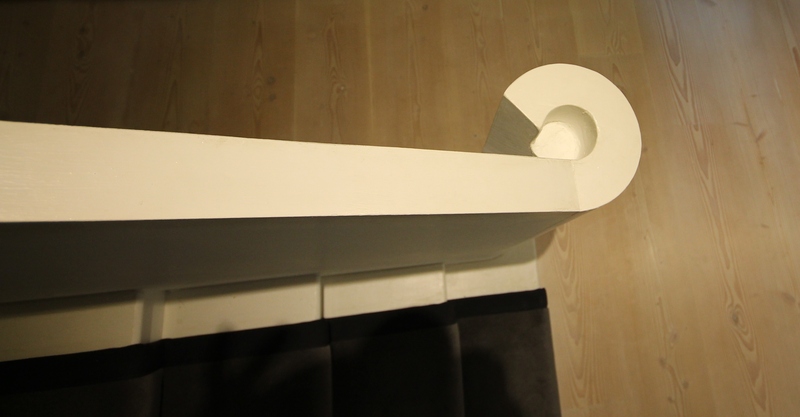 The post was carved out of a solid piece of circular timber taking inspiration from the one upstairs. Looking the other direction you can see the window in the photo above has become the entrance door. You can also see the reinstated wall to the right hand side of the opening. The streamlined cupboards on the left contain cloaks coats and bags. The flooring is wide plank Douglas Fir finished with a lye which gives a whitish tone. 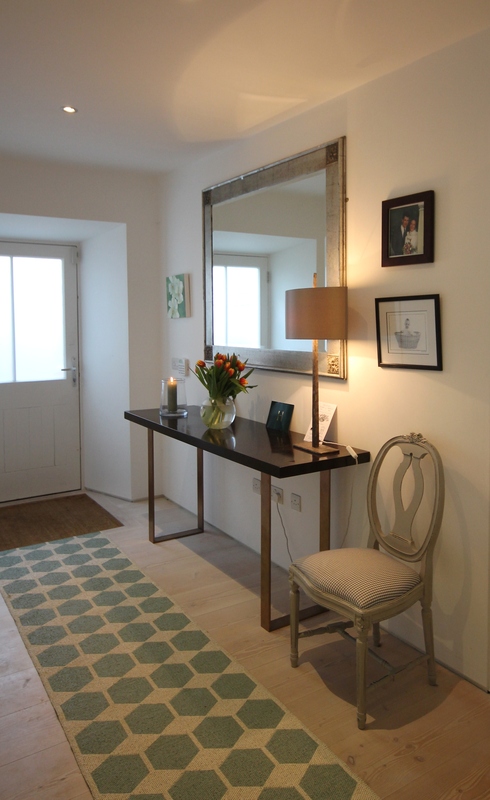 As we had decided to create a contemporary approach at this level we chose recessed downlighters here and opted not to put in a standard skirting and architrave but rather to have a “shadow gap” between the bottom of the wall and floor junction. The furniture here was all purchased at various auctions and is off set by a collection of framed family photographs and maps hung in groups on white walls. 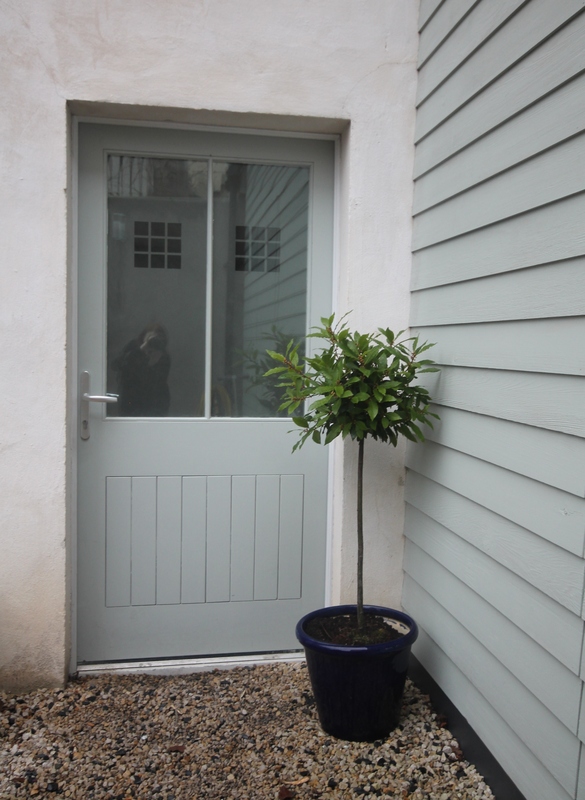 The opaque window film with the squares in the entrance door was purchased from Brume. 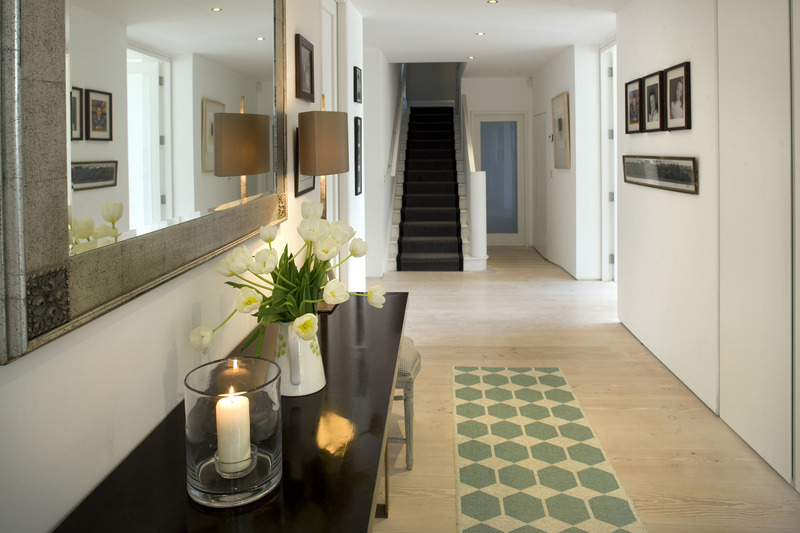 www.coda.ie contact us for architectural or interior design advice. 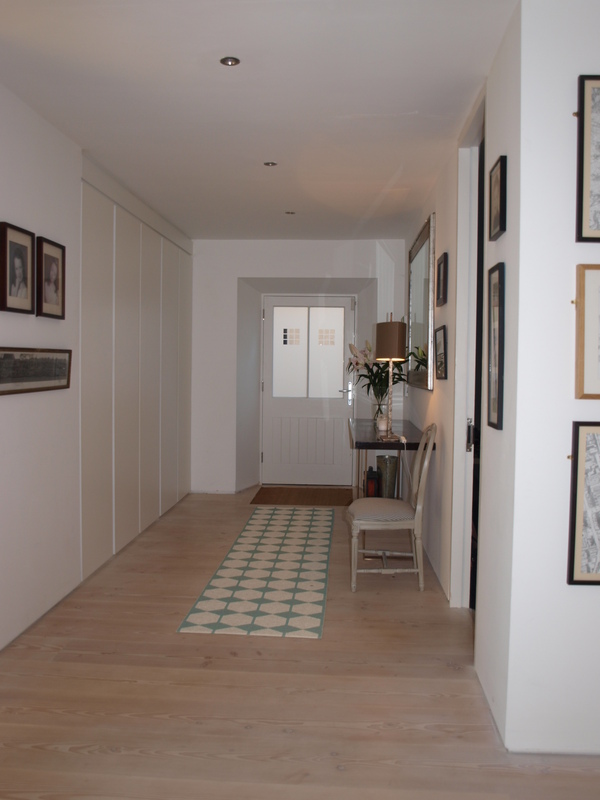 This entry was posted in Interior Design, Moving house and tagged architecture, entrance hall, interior design, shadow gap, wide plank flooring by Passionate about Design. Bookmark the permalink. Lovely stuff Nicki. Very stylish. Happy blogging to you this year too!